Martha Ricky Weiser and her family moved to Boulder in 1956. She became a community activist, was the first woman director of the Shakespeare Festival and an avid member of the Society for Creative Anachronisms. The family chose this 240 acre property because of their interest in falconry. Ricky campaigned for the development of the Colorado National Areas designation, and in 1979 her land was designated the White Rocks State National Area. 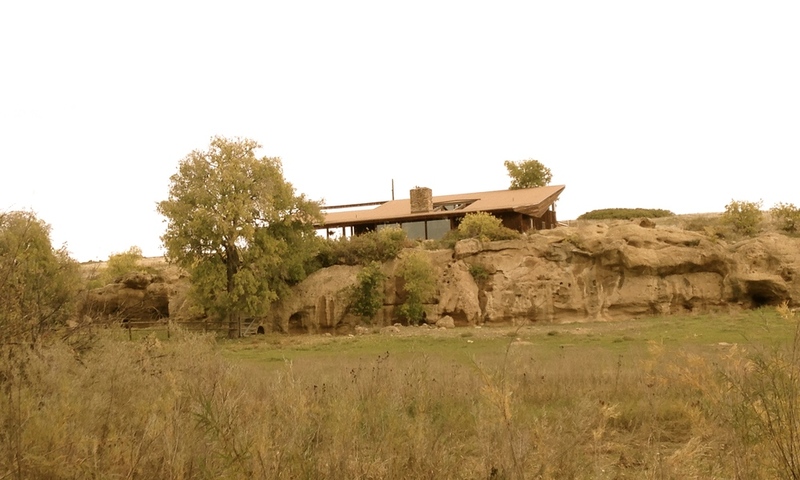 The home rests above a natural rock outcropping. Ricky chose architect L. Gale Abels to design the house that would accommodate her family, her love of falconry and appreciation of architecture and nature. Abels was a graduate of Harvard where he studied under Walter Gropius, founder of the Bauhaus School and pioneer in modern architecture. He worked with the firm of Eero Sarrinen, FAIA in Detroit, Michigan. Abels moved his family to Boulder in 1958 and started his own firm here In 1963. He was an avid glider pilot and founding member of Soaring Society of Boulder. This mid century modern house was completed 1963 it has 2256 ft.² of living space. Some years after construction, Ricky hired Ables to design an enclosure for the upstairs porch. The rest of the structure was unchanged from its original construction. She was adamant that the house was placed so that it would not damage the white rocks and that the trees along Boulder Creek would block views of the stacks of the city power plant to the south. Other than a small vegetable garden on the east side of the house, all landscaping is natural. Ricky lived here until her death in 2002. OSMP acquired a conservation easement on the entire property in 1979. In 2011, the Weiser heirs wished to sell the land, and OSMP exercised its right of first refusal by purchasing the property for $4,000,000. The house was rehabilitated in 2012. Tenants take care of the house year round, but the property is open to the public only three months of the year because of a nearby eagle nesting closure. The house is on the State Register of Historic Places and an application for the National Register of Historic Places is currently under review by the National Park Service.